Hemingway haunt great pub -- pretty cowboyed up but one of the few remaining original bars from the old days. NO NEED TO RENOVATE: America's most charming dive bar welcomes you. Great bar, open, friendly, clean. Tables to play games of several varieties (pool, foosball, shuffle board). Just not very nice, save your cash and go Else where! Even our parents were upset. Cool juke box terrible bar, might as well call this Grumpys as well. No cover the night we were there with live band. Very lively crowd with pool tables, video games, fuse ball. Minimal seating. The OJ was extremely watery so not recommend for mixed drink. what????? You mean man, go home,let the other nice bar tenders work and get rid of that man. 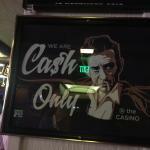 Ruin the experience of the casino club, a must while in Ketchum. Get quick answers from Casino Club staff and past visitors.